I think every mother can share the feeling of finally getting your little one(s) to sleep and walking out of their room to see the rest of your home must’ve been hit by a tornado. It happens to the best of us I don’t know about you, but I can’t stand a mess numerous messes. There will always be a time or place to get messy but feeling overwhelmed because you are forced to spend a large chunk of time cleaning it is different. So, to help eliminate this frustration from my life, I’ve come up with a few tips for staying organized throughout the day and avoiding the binge cleaning three hours before someone comes over. My first two tips are inspired from a wonderful book recommended to me by my sister-in-law called The Happiness Project. There are little messes and to-dos we pass by throughout the day and think, “Oh, I’ll just do it later.” If each of those things take a minute to do and you find 10 ‘oh I’ll just do it laters,’ that’s a 10-minute chunk of things to do later. On top of that, larger chunks of cleaning make us less likely to actually start. If you see a pan sitting on your stove, a group of toys on the floor or walk by the laundry room knowing there’s a load sitting in the washer, take literally ONE minute and do it. It will stop chores from accumulating for later, and it’ll be one less thing you have to worry about. If you’re like me, you have a hard time telling your body it’s time to shutdown and go to bed. If you’re not like me, you might fall asleep on the sofa before you even make it to bed. Either way, if you implement this time into your routine before bed, it will do two things: Get the remainder of your to-dos out of the way–leaving you to wake up in a refreshed and clean home–AND get your body into a routine that will trigger bedtime mode. 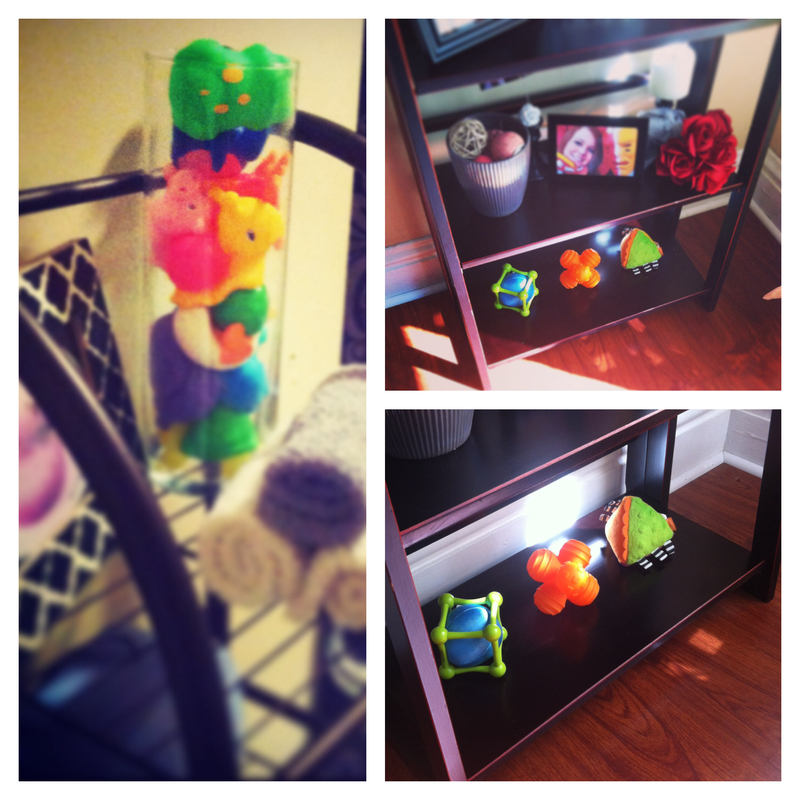 Take the toys and items you normally hide or store away and display them. It’s fun for the kids to have their toys on display and available whenever they want to play with them, but it also creates less work and easier access for you. In the picture on the left, the bath toys are displayed right next to the tub versus having to get on the floor and dig under the sink to get them out. In the pictures on the right, I just used the bottom shelf to display some of my daughter’s “cooler” looking toys instead of leaving items she could break or having to continuously pull her away from the shelf. Before children are thrown in the mix, having everything under control is a breeze. Once you have a family, the part of your brain that had control over life is now just trying to control day-to-day with the kids. 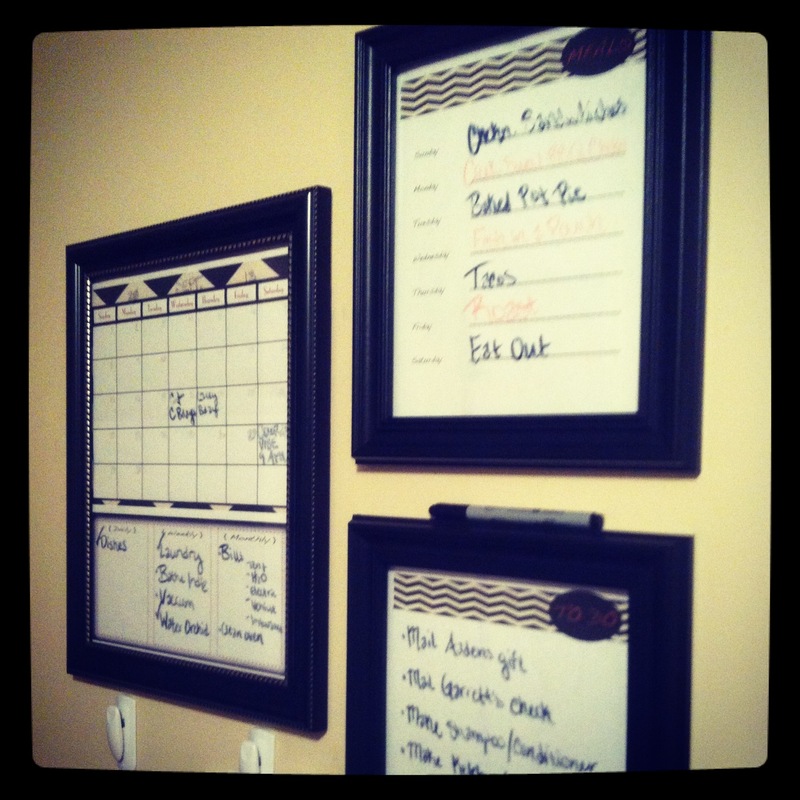 Create a board or calendar next to the refrigerator, front door or on a wall where you’ll constantly see it. Keep every little thing you can think of on it. This way you–and anyone in the house–can remember important dates, have a physical list of things that need to get done, see the mail and so on. It’s one of those things that, once it’s set up, takes a minute or less. If you think of something or make plans, go write it on the board! This one is the hardest for me because the most time-consuming chore and the chore I hate the most are one and the same: Laundry. One time after getting caught up on all my laundry, probably at 2 in the morning, I decided I never wanted to binge laundry again. So, when there’s one (yes, ONE) load of laundry that’s accumulated, I do it––no waiting, no putting it off. I can throw it in the wash in a minute or less and same with changing it over, then I can sort and put the clothes up during my tidy-up session before bed. This way, I don’t end up doing more than one load of laundry in a day, it takes me maybe 10 minutes altogether, there’s no frustration trying to find or sort through anything, and I can honestly say I don’t feel like I have to do laundry that often anymore. Laundry is my best example, but this rule should apply to anything that’s time consuming or can easily be put off and get backed up. It’s better to take a few minutes on separate occasions throughout the week than having to take hours at one time. Studies show when you live in a clean, organized environment, you feel better and you’re inclined to get more done. Take a day, weekend or one day a week until it’s done to tackle decluttering your home. This one is time consuming, and a lot of you won’t do it, I understand. I always wanted to declutter and simplify my surroundings but just never made the time for it … until I had to move. And I don’t mean move a room full of stuff from your dorm to a one bedroom apartment, I mean move an entire family and household FULL of clothes, furniture, appliances, electronics, decorations, pictures and on and on. Something like that can really make you reconsider what you need and what you don’t. After a couple months of living in our new house, it was time to get organized for good. 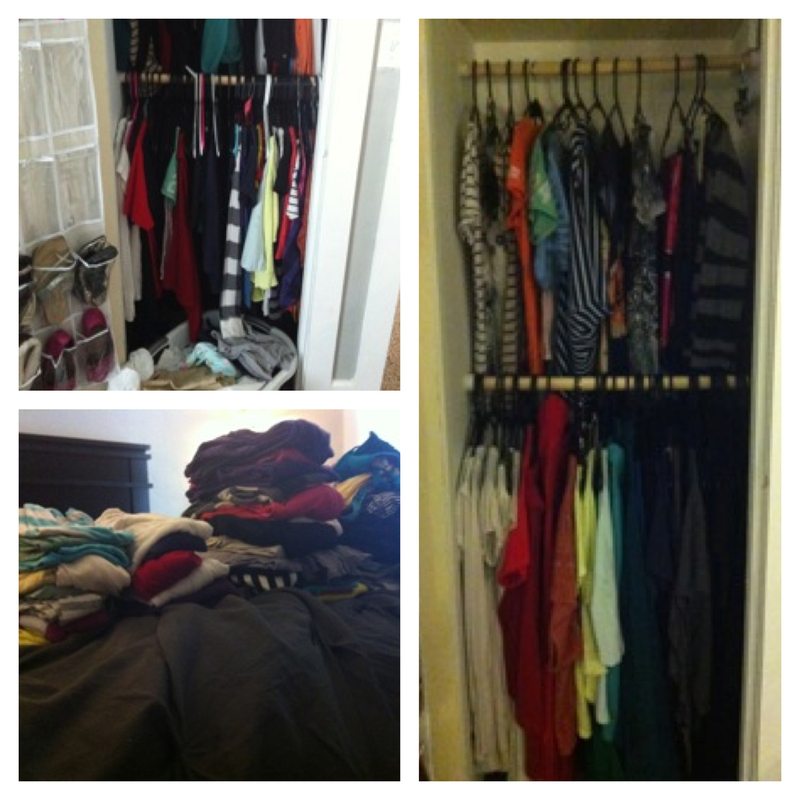 I started by sorting through everyone’s clothes and getting rid of every single item that wasn’t being worn. I then organized all the cabinets, storage, under-the-sinks and junk drawers with either labeled containers, tiny corner shelves or small storage boxes, along with throwing out things we never used. Any paper work or mail sitting around was filed into folders and for toys floating around, there is a designated spot for them when they’re not in use. There are tons of helpful tips and ideas for decluttering, but that’s a whole different post. In a nutshell, downsize, get rid of anything if you haven’t used it in the past year and organize the items you have left. Top left; My overflowing mess of a closet. Bottom left: The clothes I donated. What are your tips for staying organized? I love these tips! Your organization center is inspiring; I need something like this…all in one place. And I totally agree about decluttering and picking up (your one-minute jobs) as you go about your day – I really focus on doing this. Thanks! The organization center really frees up my mind to focus on other things, and no joke about the laundry, it’s no fun piled up! It’s amazing how much less I actually feel like I’m doing when I do a load daily (or every other day-ish) instead of all at once. Great tips! Things can get crazy quick with a little one! Thank so much for sharing on Thank You Honey’s Whatever Wednesday Party! Hope to see you this week!